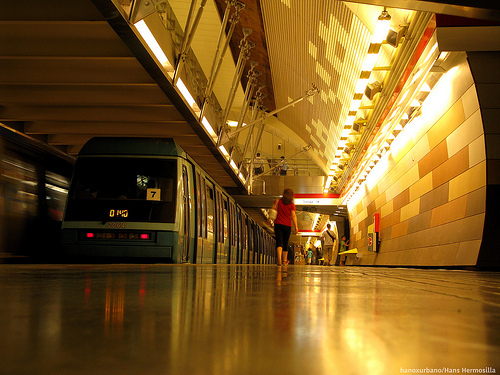 Transantiago integrates metro and bus rapid transit to improve mobility in Santiago, Chile. Photo by objetoslicitables. Transantiago, the public transport system in Santiago, Chile that combines bus rapid transit (BRT), feeder bus lines and a metro system, celebrated its third birthday last month. You may remember the news coverage from its opening weeks in February 2007. The media was filled with stories of mass confusion; long lines; metro stations overwhelmed with demand, closing temporarily; protests; and general chaos. Some of these difficulties resulted from bad planning. For instance, the system opened before bus lanes had been built, reducing bus speeds and exacerbating crowding. The technology needed for proper control of the fleet had not been implemented, so headways were erratic. And the routes did not provide sufficient coverage, particularly in peripheral areas, so people had to walk farther and make more transfers than they were used to. TheCityFix recently caught up with Juan Carlos Muñoz, associate professor of transport engineering and logistics at the Pontifica Universidad Católica de Chile and a former advisor to the Minister of Transport and Telecommunications for the Transantiago plan, to discuss the Transantiago experience. Below, he shares his perspective on the transit system’s transformation now that the three-year mark has passed. TheCityFix: Now that three years have passed since Transantiago’s rocky start, what are its approval ratings like? Juan Carlos Muñoz: They are up significantly, especially if you separate users from non-users. Approval of Transantiago among locals has risen from 13% in mid-2007 to above 40% in late 2009. Most users rate the system reasonably highly, which is an accomplishment, because in general people tend to grade transit systems quite poorly. TCF: What do you think is the biggest reason for this turnaround in public opinion? JCM: Communication about Transantiago was very poor in the beginning. Since then, people have come to better understand the system, and are now able to take more advantage of its services. Users have also seen the improvements being made to the system, and the accompanying progress in performance. For instance, the number of buses has been growing, which means there are higher frequencies. Better control of the headways has meant more regularity. The routes have been altered to better serve the population. Pre-paid zones now speed up boarding and alighting. Most importantly, the government has kept the fare flat – it’s been almost the same for three years. People realize that they have a relatively cheap system. Transantiago is far from perfect, but it’s significantly better than it was during its first semester. The Metro system has also improved noticeably, and has even started express services, which are popular. TCF: Why did officials make the decision to open Transantiago without any bus lanes? JCM: You would have to ask the authorities that question. There was a perception that the main goal of the system was not to save time, but to reduce accidents, prevent drivers from competing for passengers, and reduce noise and pollution. All these objectives were met from the beginning. But the system was performing so badly that the users could not appreciate these benefits in the face of the poor service they were experiencing. TCF: Did transit ridership decline because of Transantiago’s initial difficulties? JCM: We don’t have robust data on this. We do know that after Transantiago opened, the demand for mass transit dropped significantly. Since then, the number of trip legs on the system has grown consistently. Interestingly, the number of trips on the Metro has been dropping even though trips on the entire system have been increasing. This shows us that buses have started winning the peoples’ trust again. TCF: As the system continues to evolve, what are the priorities? What improvements do users care about most? JCM: First, the information on the system is still exceedingly poor. You see no information whatsoever at bus stops or inside buses. The system is targeted at people who are already informed, or who look ahead of time at the website. The good news is that Transantiago is fairly intuitive. It’s a trunk and feeder system, and you can assume there will be trunk services along the city’s main avenues. However, a transit system should not rely on people’s guesses – the information and communication needs to improve. Other priorities include the development of more BRT corridors, which is happening now. Efforts to control the headways must be improved, as they are still pretty irregular. The authorities need to step up the fight against fare evasion – 10-15% of riders evade the fares. Also, there is a need for more creative express services. TCF: What are the most important lessons from Transantiago’s experience? What advice would you give to transportation planners in other cities? JCM: The first clear lesson from Transantiago is that a system like this should be implemented in phases, as long as the ultimate goal of serving the whole city is not jeopardized. In other words, implementation should be phased with the end goal reached as soon as possible. The good thing about Transantiago’s approach was that the entire city was covered, but at the considerable risk of doing it all at once. In contrast, Transmilenio in Bogota, Colombia has been implemented corridor by corridor, which has brought different outcomes: they have had problems providing comprehensive service, but they have been able to gradually teach people how to use the system. It would be best to implement transit service in steps that build toward the final target. The positive outcome for Santiago is that the coverage we have now with Transantiago is comprehensive. The development of Transantiago illuminates some “best practices.” We discovered how to integrate metro and bus systems, eliminate cash payments, and introduce smart cards. We also discovered how to change operators, allow them to work as large firms, and bring new operators from abroad. Transantiago’s early missteps also provide some lessons. It is necessary to inform people really well, build the infrastructure first, and maintain some of the old routes in the design of the new system. Prepaid zones are essential where there are significant transfers. It also helps to maintain stable leadership, instead of changing frequently because of political issues. Transantiago from EMBARQ Network on Vimeo.